Zen – "Making Peaceful CONTACT"
I been doing alot of research into one of the oldest timeless books of wisdom, written 2500 BC by Lao Tzu – (Translated to mean, Old Man) This book is timeless, because I feel it’s one of the great books of wisdom that still applies today in our times. So the words I use, are just teaching words, but in really time the Tao can’t be named. Some people call it ‘Source’ or ‘flow’ ‘spirit’ ‘God’ etc…… But there is no name for this living force, it just is! The more research I do on the Tao, the more everything falls into place, maybe that’s how it supposed to happen, the Tao also tells us to live life by ‘letting go’ ‘without effort’ ‘without attachment’…… Living the Tao is to live life by letting go, trusting in things will fall into place, Nature does this every single day. The leaves fall from the trees in autumn /fall, plants start to grow in the spring and so on, it’s just the natural law. Lao Tzu talks about Water and how the rivers all flow to the great ocean, so be like water stay even and level and everything will flow to you at the right time and right place in your life. 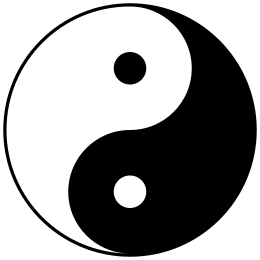 The symbols represents that everything contains its opposite, If you push to hard at something, you will get the opposite, Both Polars contain or complement each other, that’s why there’s a little circle of Yin in Yang and vice versa. The outside of the circle is the universe while both polars work together within it, interconnecting with each other. Verse 76 struck a chord with me, Learning about being flexible rather than rigid, has made one big difference in my life, I used to protect my beliefs, not letting anyone in, I was taught to stick by your beliefs no matter what, but Lao Tzu is talking about here, is to be flexible and open to new opinions, so if someone disagrees with you, don’t be rigid in your stance be open to new possibilities, but attached to nothing, that’s how we learn and live wisely with piece of mind. Lao Tzu explains how nature and the natural law prevails. A flexible mind open to everything attached to nothing, rather than rigid thought, being gentle and soft is the way of the Tao. Those who know do not talk. Those who talk do not know. Block all the passages! This is primal union or the secret embrace. swayed by profit or loss, nor touched by honor or disgrace. He is far beyond the cares of men yet comes to hold the dearest place in their hearts. This, therefore, is the highest state of man. You can listen to this book on Youtube, It comes in each verse of the Tao, with Dr Dyer’s interpretation of what Lao Tzu is saying. Link below….. I encourage you all to give it a listen, It might just change your life. These short video’s by Hyon Gak Sunim, explains what is Zen. Although Zen is an experience to be experienced by a person, I feel Hyon Gak Sunim encapsulates true meaning of what Zen is. “What am I ?” when we truly ask ourselves this…….. And turn the view inwards, thinking gets cut off, that ‘void’ before thinking arises again is our true self (Zen)……. Beautiful! He is a great teacher. I Love his way of teaching, I find he put’s Zen’s teachers/Meaning, in a way that people can understand……. The first video is an interview with him and the second is a day in a life with him. Interview with Hyon Gak Sunim. Hi guys, this is a short post, I would just like to mention the following Film that’s due to Premiere in 2017. It follows deep inside a Zen Buddhist community and the Zen teacher, peace maker and poet Thich Nhat Hanh. I Can’t wait for the film to be released, I am very much looking forward to it, as I have been a long time follower of Thay’s teachings….. Enjoy the trailer. Hi guys, thought I would drop in a post to let you know what has been happening in my personal life. As many of you know I suffer from a condition know as Bipolar disorder, I have had this condition since an early age of my life, as a result of this, I am always searching for new ways to cope with this condition and to grow and evolve spiritually . Apart from daily doses of medication, which work for me, and help keep me stable, (Well as much as they can….) I am still left with the niggling bits of this illness….. I am very seclusive, I don’t socialize very well, the PC computer is my link to the outside world,over the years I have experienced many series of Psychotic episodes, ranging from auditory voices, Paranoia delusional states etc. One thing I have learned throughout my life, is that everyone suffers in their own lives, on a daily basis and everyone wants to escape this suffering and would rather be happy, but how do we do this??? From researching and practicing Eastern Philosophies such as Zen buddhism and Taoism and the Man himself my idol Bruce Lee, I feel I have found my way to escape this suffering. My research and practice has lead me to this! Our suffering comes from our own mind! We are always constantly unaware of the thinking state, we are either thinking of past events or what’s to come, never in the moment, the chattering and commentary mind is always at work projecting these thoughts and we are so unaware of them and in most cases we are living these thoughts from past or future as the living present moment, but that shouldn’t be the case. Wouldn’t it be great if we could have a break from this mind? Wouldn’t it be great to be aware of things as they really are, without the mind causing anxiety by projecting thoughts of the future or past clouding our decisions if to do something or not out of life? Through Mindfulness Meditation or self inquiry we can accomplish this, as everything it takes daily practice to achieve something, but I have found it’s well worth it. Lets break Mindfulness meditation in half to explore whats going on here. When sitting for mindful meditation, one needs to find a quiet place to do so somewhere where you will not be disturbed for a while. You can sit in a chair or lying down or in the basic crossed legged architect position. First, Half close you eyes and gentle glance to the floor, now the next step is to pay attention to your breathing, feel the breath as you inhale and exhale, breath from the centre of your stomach (Not your chest) Breath naturally not forced. This breath awareness will ground you….Of course you mind will not let you concentrate for long, it will start to project thoughts of the past or future, memories, goals etc, People think mindful meditation is about NOT thinking, stopping all thoughts, this is impossible!! What this meditation is about is to learn to be fully aware of when your thinking, when it arises. So lets get back to the Meditation method, when you feel you mind being pulled away from your breathing, let the thoughts come, you may want to label it gentle by silently saying “thinking” then let the thoughts dissolve gently just as a cloud comes and disappears.DO NOT try to avoid your thoughts, just let them simply come and go and gently retrun back to your breathing, keep repeating this as the thoughts occur. this is know as taming the mind or monkey mind. This in between thoughts…. Is what we are aiming for, before a thought arises again, this is zen… This is the state of serenity in which we are just there in the moment, everything just as it is!!! No thoughts of past or future, no worries or anxiety, This state of mind with practices, gets bigger and bigger, so you can be in the moment when you are washing dishes, out walking, when worries occur etc. In the beginning of sitting, you will experience you mind will be all over the place, one minute you will be watching the breath, then you thoughts will take you away from it for minutes at a time, without you even releasing it, but with pratices you will learn to tame this mind. This can take a life time to become total in this state of mind, but I found big changes in myself, after a few weeks or months after practicing mindfulness meditation. I felt calm in myself more, and able to handle inner and outer turmoil better. Anyway, I hope that my research and practices brings you some goodness to your life as it has mine, Zen is a daily practice for myself since November 2015 and each day I am becoming more aware and living in the moment and learning about my true nature of who I am……. As always, please email me if you have any question, take care. All of the above is from my own practice and research, I do not claim to be an experienced tutor in Mindful meditation, I am self taught.